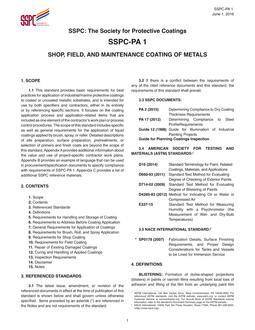 PA 1 provides basic requirements for best practices for application of industrial/marine protective coatings to coated or uncoated metallic substrates, and is intended for use by both specifiers and contractors, either in its entirety or by referencing specific sections. It focuses on the coating application process and application-related items that are included as one element of the contractor's work plan or process control procedures. The scope of this standard includes specific as well as general requirements for the application of liquid coatings applied by brush, spray, or roller.